Subclass capable of loading asset data to/from an external source. Currently, a web server accessed via curl. Definition at line 56 of file llhttpassetstorage.cpp. Referenced by LLHTTPAssetRequest::prepareCompressedUpload(), and LLHTTPAssetRequest::readCompressedData(). Definition at line 52 of file llhttpassetstorage.cpp. Definition at line 54 of file llhttpassetstorage.cpp. 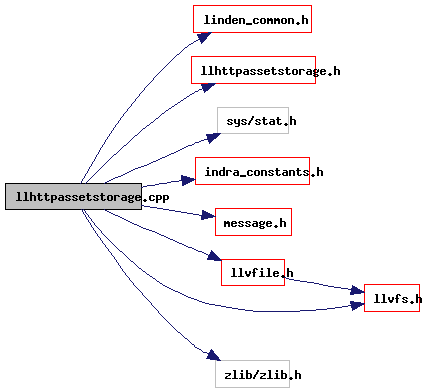 Definition at line 61 of file llhttpassetstorage.cpp. Referenced by LLHTTPAssetStorage::checkForTimeouts(), and LLHTTPAssetStorage::getURLToFile(). Definition at line 60 of file llhttpassetstorage.cpp. Definition at line 58 of file llhttpassetstorage.cpp. Definition at line 59 of file llhttpassetstorage.cpp. Definition at line 62 of file llhttpassetstorage.cpp. Definition at line 63 of file llhttpassetstorage.cpp. Definition at line 51 of file llhttpassetstorage.cpp. Definition at line 50 of file llhttpassetstorage.cpp.